Hey folks, James here. While I usually don’t blog (the internet is a passing fad), Hannah told me that I could write a post about anything. Let me repeat that. Hannah (usually a very reasonable person by most measures) told me (a virtuoso of unsolicited advice and grumbling) that I could write a post about anything. Now, if you’re a regular here at Hannah’s blog, you know she doesn’t employ snark too often. I do. Don’t say you weren’t forewarned. As I said, Hannah opened Pandora’s box when she told me that I could write about whatever I wanted. Now, everyone knows that blogs are for super important issues like the European debt crisis, the longevity of the social safety net, and global warming. Oh, add to that list: lonely women with cell phones and mirrors, uninformed political rants, washed-out photos of your stupid hipster wedding, trashy Halloween costumes, 101 arugula recipes that will drive your man wild, and pictures of animals/kids/kids dressed like animals. Like I said, blogs are for matters of great import. That’s why I am proud to use this opportunity to outline my hatred for Instagram. Instagram kidnaps people. Hannah loves life, color, and aesthetics. She was an easy target. Every meal, every walk, every new purchase, and every lazy Sunday is captured in sepia tones. For those blessedly unaware, Instagram is a platform for folks with iPhones (that’s another rant for another time) to share their pictures with other members of the Appled-class. I’ll be the first to admit that this is a technological marvel. We truly stand on the shoulders of giants. Roman roads connected an empire. The printing press fomented the Reformation. Instagram shows everyone what you just ate. With elegant simplicity, Samuel Morse sent the first telegraph by asking: “what hath God wrought?” If he’d been around 168 years later he might have hashtaged “#bottomlessmimosas!” and included a picture of “brunch” (the meal formerly known as breakfast, aka the most important meal of the day because people used to do stuff instead of sitting around on computers). Instagram thrives on narcissism. You’re more self-absorbed than Dorian Gray in a house of mirrors, if you think that the rest of the world is dying to see the minutiae of your daily life. That’s not to say that the stuff with which you surround yourself carries no value. It does. But sharing your daily life with the anonymous masses just might devalue the small things that help impart real value to real life. Life should be enjoyed. Enjoyed does not mean photographed at every turn. 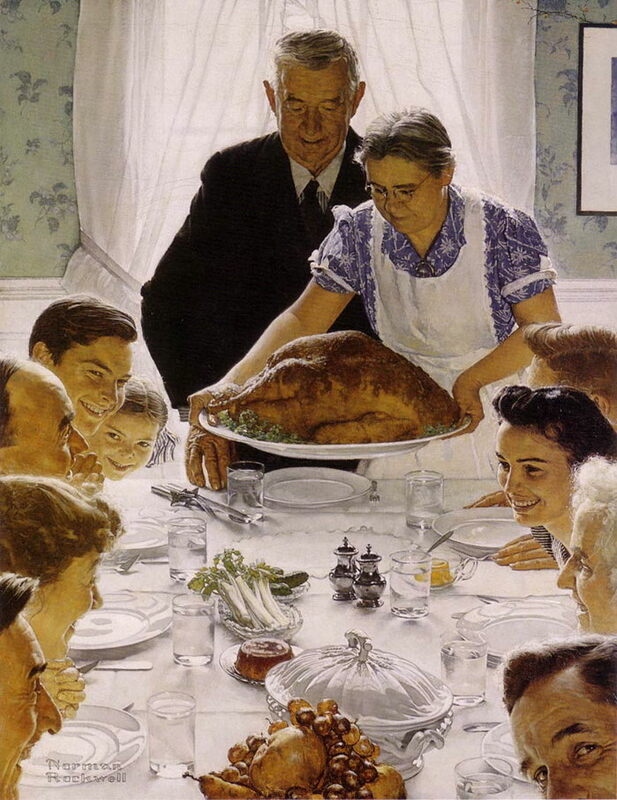 Think about Norman Rockwell’s “Thanksgiving Dinner.” Everyone is focused on the moment at hand (in fact, the only one not immersed in the current activities- lower right hand corner- is looking at you like you’re missing out!). Today, there’d be no end to the Instagram incursions. The turkey. The tablecloth. The silverware. Good stuff, to be sure. But meaningful in its context. Do yourself a favor and keep Instagram away from the table this Thanksgiving. This entry was posted in Uncategorized and tagged confessions, husband, instagram, James, Norman Rockwell, photography, technology, Thanksgiving, venting. Bookmark the permalink. Homère is also a hater of Instagram. I pity you both. It’s fun, and you can take pictures of more than food. I am breaking my usual comment-silence to endorse this post. Instagram is base and invasive. Indeed, photography generally is a thing I’m still not quite sure about. I think maybe a photo steals a piece of your soul. If so, then I’m glad to know that your soul is still mostly intact, you picture avoider you. LOL (no really, I did)! Awesome. Why doesn’t James write more often? Not that Hannah’s posts aren’t entertaining, of course. It’s ok, we can all admit it: he’s funnier than I am. Stodgy grouchiness beats happy reflections every time. oh James, what a wonderful curmudgeon you are! I have been married to a delightful curmudgeon for twenty-five years now, and I must say, it is definitely the way to live! Hold fast to your opinions! James, you’re misguided. Also, you just upgraded from a Blackberry, which calls into question your sense of priority. If the ideal world looked anything like that Rockwell painting (which I think we can both agree, those people are all feigning smiles), then please put an end to all this for me now. I’ll take a #nofilter, #foodporn, #turkeyofinstagram photo of a meal any day over that sham of a scene. I typed and deleted like ten comments because I couldn’t adequately express how much I liked this post. Obviously the Zoutendams are all about the shared blog experience. A century or so ago, De Tocqueville posited that democracy transforms men from virtuous men into effeminante boys. At least he never saw instagram…or worse…blog posts about instagram.